Photoplay grew out of one man’s mission to reverse the tide of film history. Kevin Brownlow began working in the cinema professionally when he entered documentary production in 1955 with World Wide Pictures, becoming an editor in 1958. In the 1960s, he was Lindsay Anderson’s editor on The White Bus and supervising editor on Tony Richardson's The Charge of the Light Brigade (1968). 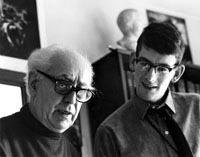 With Andrew Mollo, he directed two feature films, It Happened Here (1964), and Winstanley (1975). But before all of that he had fallen in love with silent film. As a collector, from age 11, he discovered what so many other people seemed to have forgotten: that silent film was an art form in its own right, rather than a primitive step on the way to the maturity of the talkies, and that the people who made them had extraordinary stories to tell. Spurred on by this, and wanting to share his enthusiasm, he conducted a serious of interviews, which formed the basis of his first published book The Parade’s Gone By (1968). In 1975, inspired by this book, Thames Television commissioned Brownlow to make a television series celebrating the early days of Hollywood. He was teamed with David Gill, a staff director for Thames who shared a love of cinema, and whose early career as a ballet dancer seemed particularly appropriate to the project. The series that resulted, Hollywood – The Pioneers, was received with great acclaim when it aired in 1980. For perhaps the first time, television had been able to do full justice to the silent film; the clips were comprehensive in their coverage, of the highest quality then possible and shown at correct speeds. And most importantly, they were supported by music that was of the highest standard, and precisely matched to the footage. This was Carl Davis’s introduction to scoring for silent films.